Shortcut for a XmpArrayValue auto pointer. Constructor. 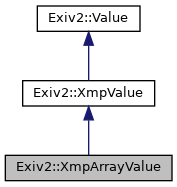 typeId can be one of xmpBag, xmpSeq or xmpAlt. Value type for simple arrays. Each item in the array is a simple value, without qualifiers. The array may be an ordered (seq), unordered (bag) or alternative array (alt). The array items must not contain qualifiers. For language alternatives use LangAltValue. Uses a vector of std::string to store the value(s).